Fig. 70 Product positioning. 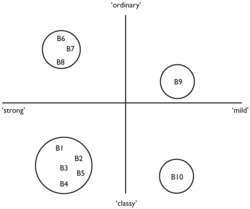 Perceptual map. a process whereby a marketer identifies the set of products which compete with the product under analysis, identifies key product attributes in the set, collects information from customers/ prospects on perceptions of products and their attributes, determines the product's position on a perceptual map, determines customers' or prospects' ideal position(s), examines the fit between product position and market (customer) preference, and then selects a positioning strategy. The technique of ‘perceptual mapping’ is often used to chart consumers' perceptions of brands currently on offer and to identify opportunities for launching new brands or to reposition an existing brand. This technique involves identifying perceived product characteristics which may be used to classify consumer opinions about brands of a product. Thus, in Fig. 70 the two axes of the ‘map’ show the perceived product attributes, ‘strong’/‘mild’ and ‘ordinary’/‘classy’ for cigarettes while B1 to B9 on the map indicate consumers' perceptions of existing brands of cigarettes on offer in terms of these characteristics. Brands show market segments which are currently being serviced by existing brands and ‘clusters’ of brands suggest larger volume segments. A positioning strategy seeks to differentiate the firm's brand from competitors' brands in terms of product characteristics and ‘image’ so as to maximize sales potential. In positioning brands a firm may choose to offer a ‘copy-cat’ or ‘me-too’ brand in a well-served market segment which is very similar to competing brands, with minimal PRODUCT DIFFERENTIATION (Brands B1 to B5 in the figure). This stratagem may be viable where this segment represents a high proportion of total market sales so that even a small brand share would result in large sales. Alternatively, a firm's MARKETING RESEARCH may reveal untapped demand potential in different market segments, so that it may choose to distance its brand from competing brands with a high degree of product differentiation, introducing a new brand (B10). See MARKET SEGMENTATION, PRICE QUALITY TRADE-OFF, PRICING POLICY, PRODUCT IMAGE, PRODUCT VARIETY, BRAND EXTENSION. The purpose of this research is to examine the role product positioning quality and product attractiveness advantage in order to bridge the research gap between the product innovation and consumer purchase intention. The innovative iCon conveying system, which has been developed jointly by conveyor system specialists AlphaChase and packaging experts, Linkx Systems, offers a convenient and flexible solution to the problem of accurate product positioning on conveyors. As a result, FMC gains valuable customer focus on their products while the retailer gains a better understanding of all product positioning and perceptions of value in the market place. This report will analyze the possibilities for Nokia's new product, including a PC-like product positioning scenario and a non-PC-like product positioning scenario. In addition, it provides an array of informational pieces from Mycogen's agronomy technical department, including tech sheets, grain characterization, herbicide management suggestions, hybrid characteristic ratings and product positioning guidelines. This Ntrinsic proprietary process validates or creates the integral components of a successful marketing effort to identify the company or product positioning, elevator pitch, unique selling and value propositions, key selling statements, key competitive differentiators, ideal customer profile and a customer pain map. Hartlen will expand Kalido's market awareness and generate demand for its solutions by leading all aspects of the company's marketing proposition, including product positioning, lead generation, communications and product marketing. There is a great need for profit optimization and careful product positioning and repositioning in the frenetic but unforgiving RFID market that is increasing ten times to become a $26 billion business in 2016. During his tenure at Egenera, he built the tools, processes and product positioning to enable dramatic revenue and customer growth - resulting in a customer base of over 100 organizations and a $300M OEM agreement with Fujitsu Siemens Computers. Mercer has consulted with various high tech startups assisting with product positioning, strategy, M&A, and business development. He will be responsible for all aspects of marketing including corporate and product positioning, outbound customer, product and partner marketing programs, communications and branding, and field sales support.